This book elaborately examines Turkish organized crime groups, revealing their emergence and growing in Turkey and becoming some of the most dominant criminal organizations operating mainly in Europe. 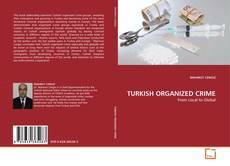 The book demonstrates that organized crime groups operating in Turkey and Turkish criminal organizations in Europe whose members are composed mainly of Turkish immigrants operate globally by having criminal networks in different regions of the world. Drawing on a wide body of academic research – diverse reports, field work and interviews conducted by the author over the last twelve years in Turkey and Europe – Mahmut Cengiz concludes that Turkish organized crime regionally and globally will be active as long there exist the impacts of several factors such as the geographic position of Turkey, increasing demand for illicit trade, immigrants from developing countries in Turkey, Turkish Diaspora communities in different regions of the world, and obstacles to effective law enforcement cooperation.